Ubuntu Feisty on your USB drive – finally! IMPORTANT NOTE: Unless for some specific reason you want to run Ubuntu version 7.04 specifically from your USB Drive, this tutorial is deprecated. I’ve written an updated and much easier tutorial on how to run the latest version of Ubuntu from your USB flash drive. Important: As SurJector mentions, he has found another workaround that is much less work. After you have followed his instructions, you can skip on to the partitioning part (i.e. that part that is very similar to almost my whole post about putting Xubuntu on your USB drive). Update: I now also have a guide on putting Xubuntu Feisty on your USB drive. Note: All screenshots are also available as a slideshow. 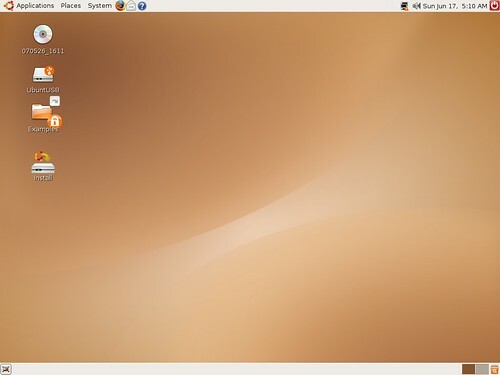 When, in June 2006, Ubuntu Dapper Drake was released, it introduced a very exciting new feature: the ability to run it from a USB drive (also pendrive, USB bar or memory stick). This would work just like a LiveCD, with the big improvement that all your data could be saved onto the USB drive! This means not just your documents, but also e.g. network settings or your desktop background. You were practically carrying around a fully-functional operating system on your USB drive! However, as Ubuntu 7.04 “Feisty Fawn” contained some new packages, it also introduced a bug due to which your data would no longer be saved. When it was released, this bug still wasn’t fixed. It is expected to be fixed in the next release, 7.10 “Gutsy Gibbon”, to be released in October of this year. Up until then, we’re out of luck. You’d think. However, thanks to the hard work of Mike (mjpca on the Ubuntu Forums) and some others (see the bug report on Launchpad and the thread on the Ubuntu Forums) there is now a way to work around this bug, which I’m going to show you in this post. The basic idea is that the files that prevent persistence (the ability to save your data to the USB drive) from working can be replaced by their previous versions as present in Ubuntu 6.10 “Edgy Eft”. However, because files on the LiveCD are compressed so they can fit on one CD, replacing these files requires quite some effors. Luckily, Mike has done all the hard work for you and has created a new hybrid Edgy/Feisty image. To use it, your computer needs to be of the type Intel x86. Don’t worry, if you don’t know what this is, you probably use it. Furthermore, I recommend you use a USB drive of at least 2 GB, because the image is quite large. For those with 1GB USB drives or who prefer Xubuntu (which would be me ;)) I plan on creating a Xubuntu image, but I’m not quite sure if I’m able to. If it works out, of course I’ll post on this blog. Note: This tutorial is adapted from this How-to from Debuntu.org. We then create the first partition, which will contain Ubuntu. Set its size to 840 MB (which is the same as MiB), its filesystem to FAT16 and leave the rest as is. We will then create the second partition, which will hold all of our data. Just let it take all of the remaining space and set the filesystem to ext2. Make sure that every partition is unmounted. If a partition is not, right-click it and select unmount. You then see an overview of how the drive will be partitioned — click the checkmark or select Edit->Apply to apply your actions. It will ask you if you are sure, because it will erase all your data. If you’re fine with that, select Apply. You’ll then have to wait a little while Gparted applies the operations. When it’s finished, you can close Gparted. Now you need to format each partition and give it a label. The name of the first partition, which holds Ubuntu, does not matter that much, however, the partition that needs to hold your data needs to be named casper-rw. This will take a bit longer, and will also output more. And here comes the fun part. You need to download the image that Mike created (generously hosted by pepeio. Use the second ISO he created). After it has finished downloading (can take quite a while) you need to extract the .iso file using Xarchiver. I recommend you to save it to a folder in /tmp so that it will be deleted on shutdown, because you don’t need it after you’re finished. I saved it to /tmp/ubuntu-livecd. Make sure you check “Extract files with full path”. Now you need to copy some files (which contain Ubuntu) to your USB drive, onto the first partition (which I named UbuntUSB). First copy the folders casper, disctree, dists, install, pics, pool, preseed and .disk (to see this one, select View->Show Hidden Files). Then we need the files md5sum.txt, README.diskdefines and ubuntu.ico. 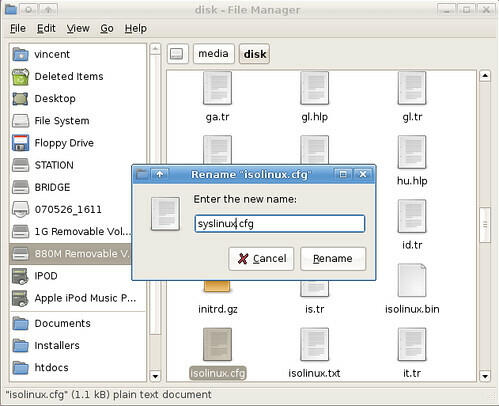 Then move to the folder “isolinux” in the extracted folder (so for me, that would be /tmp/ubuntu-livecd/isolinux), but do not change your location in the USB drive. Copy all the files that are present in the isolinux folder to your USB drive. Then, move into the “casper” folder in the extracted folder (/tmp/ubuntu-livecd/casper) and copy vmlinuz and initrd.gz to your USB drive. Finally, move into the “install” folder in the extracted folder (/tmp/ubuntu-liveusb/install) and copy mt86plus to your USB drive. If this tutorial worked for you, please leave a reply in the comments here. If it didn’t work, you can also leave a comment, or rather (if you have an account) post a message in the Ubuntu forums thread, so we can find a way to fix it. Note: If you want to create a new user, be sure to grant administrator rights, otherwise it may cause errors. I finally got the computer to boot from the USB stick. I had to set the fat16 partition to bootable. ‘cfdisk /dev/sdx’ should do the trick, just press enter on the set bootable option. If you want more than the two partitions described here on your disk, be sure that the first partition needs to be the FAT16 partition, as that’s where the bootloader gets loaded which needs to be on the first partition. Thanks Matt. If, during shutdown, the screen switches from the shutdown screen with the Xubuntu logo with the progress bar to a black screen, possibly with error messages, then you computer is probably just shutting down the normal way without notifying you of its status. At a certain moment (not too long after the screen turned black) it will have reached the point where it would have normally said something like “remove the disk, close the tray (if any) and press enter”. So when the screen turns black, you just have to try to press enter a little while after it has turned black. The live option works… but whenever i try to boot in persistent mode i get the following “cp: unable to stat ‘/root/var/log/’ : Not a directory” any ideas? Does that happen to you with either of the edgy and feisty distros when booting using the persistent boot parameter (even though persistent doesn’t work on the standard feisty)? The most problematic part was the partitioning, because Xubuntu kept mounting my new partitions automatically. – (Supposing it’s possible) how do I access the hard drive from the USB? Great job with hosting the .iso and setting up a torrent. I’m seeding the torrent now with 400+ KBps upload bandwidth for the next three hours, and 9-5pm (PST) tomorrow, until some more people pick it up. Can we somehow after unpack iso delete unnecessary programs like ie. games or open office to make all smaller ? Would it be possible to substitute two 1Gb flashdrives instead of one 2Gb? Do I just have to make sure I use the correct drive path? I don’t have the money to spare for a 2Gb, but have plenty of 1Gbs. Kallikrates, I suppose your hard drives are just visible on your desktop. Otherwise you could try to manually mount them (e.g. “sudo mount /dev/hda1 /media/hda1”). The FAT16 partition holds Ubuntu (well, actually it contains some files to make sure it starts up, and it contains a file that will be uncompressed upon boot time which contains Ubuntu). The ext2 partition will hold all your changes, e.g. your /home directory. NaPeK, no, that’s not possible, that should’ve been done when creating this file (which Mike did). However, at the moment I’m working on a Xubuntu version, which comes without games and uses light-weight office apps. Furthermore I’ve removed all language packs except for English. It should take up far less space. Toad, you can use two 1GB flash drives, if you just use one flash drive as the FAT16 partition (which you would need to boot from) and the other one as ext2. In fact, with versions of Ubuntu in which persistence worked (i.e. Dapper and Edgy) you could also use a LiveCD and an ext2 USB drive. You could also wait for my Xubuntu version and try to cram it all onto a single 1GB drive. But if the user runs a dual-boot system with a SATA drive, then /dev/sda1 is their primary hard drive. Running the command verbatim would break their primary hard drive OS (and if that’s Windows, it can be a big pain in the but to recover it). Not everyone is experienced enough to catch this error! There are other places that need to be fixed as well, but you can find those. Fisslefink, you are absolutely right, thanks for mentioning it. I’m going to edit it now. Couldn’t find them on my desktop or /etc/fstab. I tried to mount them manually, but as I forgot to give them a mount point, it didn’t work (*facepalm*). The FAT16 partition holds Ubuntu. The ext2 partition will hold all your changes, e.g. your /home directory. That’s what I thought, but better to make sure. Hi, I’m trying to do this with my External USB HD (Don’t have any flash drives, so I have the partitions you talked about, plus a mammoth 100 gb fat32 (which was unaffected). misinterpreted as having a 12 bit FAT without mount option “fat=16”. also, if I were to try to apt-get something from this live USB, would it go to the EXT2 partition, or would it just wind up trying to go to the fat16 part? If the latter, would it be worth it to add an extra amount of space to the fat16 partition? I don’t know the answer to your first question (sorry) but if you were to apt-get something from the LiveUSB it would go to the ext2 partition. I finally got the computer to boot from the USB stick. I had to set the fat16 partition to bootable. ‘cfdisk /dev/sdx’ should do the trick, just press enter on the set bootable option. Perhaps you could mention something about this in your how-to? I figured the first part out: The last line needs to be /dev/sdb2, because the first partition is sdb1. Toad, I added it (at the bottom, at “Troubleshooting”). Thanks. thejapanesegeek – which line needs to be /dev/sdb2? Which is so much neater, and lets me try out other liveCD images with ease. Persistence still works. Vincent: Anywhere you put /dev/sdx1, I needed to do /dev/sdb2. thejapanesegeek – are you sure? Is /dev/sdb2 your FAT16 or ext2 partition? If worked for me using /dev/sdx1. If /dev/sdb2 is your FAT16 partition – in what order did you create the partitions? Did you do it in Gparted? Can anyone host the bittorrent if they already have the file? Vincent: This is because the hard drive I was using had three partitions, instead of the two you described in your tutorial. This means the fat16 is sdb2, and the ext2 is sdb3. I finally made it through the tutorial and I belive I have everything right. However, my computer will not recognize my USB drive during the boot sequence. I have the boot flag set on the partitions (I first tried it on the fat16, then the fat32, then the ext2, and the computer refuses to belive it is there. The BIOS has an option for booting of a USB hard drive, and when I tried to install plain old ubuntu (Not live), it at least saw and attempted to boot from it. But now it doesn’t even come up in the boot menu. And in the BIOS, it says NOT PRESENT. When I disable booting to other drives, it just tells me no bootable devices were found. I’m just 1 1/2 hours away from getting the download. It has taken over 20 hours so far and is still going. I tried using an FTP client, but that didn’t work so I’m just using a browser to download it. 11 Kbps. Ouch! Thanks for who ever seeded it last night… i got 209megs downloaded of it so far. Could others please seed if you have the file please? I will seed as well, Thanks. You could try using “wget” (perhaps with the -c option to continue a previous download, so that whatever your got with the torrent will remain. Do check the md5sum though). thejapanesegeek – sometimes my USB drive isn’t found either, but then turning off the power (so not just turning the computer off, but completely pulling out the plug) helped. Any thoughts? I’m trying to do this on a 250 GB external USB drive. Excellent! Thanks for providing the tutorial work around for this – it always seemed pretty amazing to introduce such a great concept such as USB storage, only to blow the ability to save – that’s quite a bug! Dungeon – that’s great. I’ve also got this Xubuntu image (I’m still working on the blog post blog post here), would it be possible to host that one too? Sure but at the moment I have no possiblity to load torrent files. Sweet. Thanks for the tutorial. I did this as well and it worked… it was definitely crucial to set the FAT16 to boot as TOAD mentioned. I tried this once before using Edgy but that step was missing I guess because nothing worked. to set it all up. Then I created a user… I had to do this twice because I didn’t give that user admin privileges. This is definintely an important part of the process from what I could see… may be obvious to some but since I am a Linux newbie it wasn’t to me. The only question I have now is when are you supposed to unplug the USB on shutdown or restart? It gives the remove disk screen.. so I just press enter, but nothing happens. Should I remove the USB at that point, open the disk tray just to send a signal then press enter? It isn’t too clear when it is safe to remove the USB pendrive. Very cool, though… wish they would fix this bug in the usual release! It is much better than having a CD around. zenobiaflex, thanks for your lengthy comments, I’ll revise the post a bit. i have the same problem as thejapanese geek has. Thanx a lot. That works. And I used standard ISO. Grindz, if you use a normal Feisty ISO then persistence won’t work (so all your files and settings won’t be preserved). I don’t know where is this Grub from:) As I said, I did everything as it is in the tutorial and everything was looking OK.. (I installed the syslinux bootloader, etc). Can anyone point out what I’m doing wrong? I haven’t mentioned I was trying that trick on ibm thinkpad z60m. I’ve just read that z60m model can’t boot from the usb drive if there’s a syslinux bootloader… it may be the answer..
PiterP, perhaps you could try following the instructions in Fisslefink’s HowTo, which explains how to use Grub as bootloader. Hi, thanks very much for the tutorial. I have a little problem though. I followed all the steps, and it seems to boot correctly. The problem is that internet connection and sound don-t work. The fact is that they do work when I use Ubuntu Feisty live cd. Probably I should mention that they didn`t work when I used Edgy. Could it be because of the hybrid nature of the .iso file? By the way I used the larger image. Or maybe I did some step wrong? Riccardo, I very much suspect it’s because there still are some Edgy parts in it, and that you experience the same problem as you had in Edgy. For now, the only thing I can think of is first trying the smaller image (it has less Edgy files) and otherwise you should try following this tutorial with a Dapper ISO. this show a success message, but I try again to execute syslinux command and the same result. Someone can help me with this? Did something happen to my download? Ernest J Schwaegerl, there should be an isolinux folder, but the file xubuntusb.tar.bz2 was meant to put Xubuntu on your USB drive, not Ubuntu. Be sure to download the second file that Mike created (or the first one if you get problems with the second one). If that code is the same as in the MD5 file then you downloaded it correctly, if it differs then your download was corrupted. did you ever post the stripped down version of xubuntu you were talking about? The original location takes forever// slow..
wilsonb, my next post discusses how to put Xubuntu Feisty on your USB drive. Note that it’s not a stripped down version of Xubuntu (except that I’ve removed the language packs), but Xubuntu is just lighter than Ubuntu in the first place. After some days, finally the thing works (with GRUB not with syslinuz), but now the problem is that never I can shutdown smoothly, when I shutdown the Ubuntu logo appear but on about 80% the screen is getting black and the computers does nothing. In some occasions I must to push ctrl+alt+Fx and blindly (because the monito is black) retry with reboot or init 0, if I logout as a ubuntu user some times it works, but some others or if I logout as another user I must to reset my computer. This with my office (Intel Pentium IV) and on my home computer (AMD Athlon XP). I’m using UbuntuFeistyPatched that downloaded from here. Someone has the same problem? or better, has a solution or at least the reason why this happens? JorgeQ, I have the same (sometimes there also are a lot of error messages) but in fact, it is just working, but without notifying you. If you wait a little while, it will reach the stage where you’d have to “remove the disk, close the tray (if any) and press enter”. The problem is: you won’t be notified when this stage is read. So to shut the computer down correctly, you’ll just have to press enter after the screen has been black for a few seconds. I’ll add it to the troubleshooting section. Hmm….I can’t seem to get this to work. I think its my drive though, since I couldn’t get the Edgy tutorial from PenDriveLinux to work either. With both of them, my computer just says “Boot Error”. No error code, nothing to help me debug it, thats it. I applaud the efforts that went into this! Great job. I have been wrestling with challenge: on many computers “in the wild” you are not able to reboot, thus it would be helpful to have the ability to use QEMU and boot directly from the host, with the “QEMU” or “Persistent” cheatcode. This is doable when the .iso is copied directly to the root partition, but when a native-boot install is used, how can this be done? I suppose you could always install the native boot to a second partition that is not normally visible to windows, flag it as bootable, and just put the .iso and the QEMU/QEMU win.bat files in the first (visible) partition, but this in essence puts two copies on the USB, and space is at a premium. Ideally, something like DSL-embedded could be set up, which allows both QEMU and native boot. In my opinion, the use of VMs like QEMU and BOCHs should be getting _way_ more attention than native-boot, because most of the utility of the USB pendrive involves portable computing when you *cannot* assume you will be able to do a reboot. The ability to do either based on what you have available should be the goal. If anyone has some idea of where to start, I will play around with it. Finally, what sort of lifespan does the persistent mode impose on flash drives? The number of write-cycles a typical pendrive will endure is relatively few (900,000-1,000,000), and anything that will minimize writes should be utilized. Hey d33p, ever found a solution for your double qemu + native problem? I can only find it for PDL, not for Ubuntu or other distros. I’m sure it’s doable though. any suggestions. Works great! I partitioned to 3 disks instead, an extra 512mb partition which I formatted FAT32, so I can store files on this disk and read it on every system I come across (without having to boot into ubuntu). I think it’s not possible for the user “ubuntu”, that it is a special user for the LiveCD. However, I did manage to create an extra user with a password and then disable auto-login for user “ubuntu” (you can do so by pressing Alt+F2, and then entering gksudo gdmsetup). Then I could delete the user “ubuntu” altogether. i have a 60gb external hard drive that i’m going to try this on soon (i’ve successfully installed edgy onto it, but i prefer feisty). does anyone know if there’s a “mount” command for windows? my ideal set-up would have a fat16 partition with the livecd files on it, then an ext2 with the persistent bits, and then a large ntfs partition. however, in my experience, windows only mounts the first partition. anyone know a fix? These directions advise to use ext2 on the USB key when it gets formatted. Why not ext3? Is there a good technical reason not to have journalling (which perhaps ought to be mentioned? Will ext3 somehow screw up the casper goodness? I know the journalling makes performance a little slower, but I have a decently fast USB stick and want journalling. In the instructions below the ext3 filesystem is used. For a memory stick however where space is tight, the ext2 filesystem will use up considerably less overhead and is probably good enough for this purpose. So you can use ext3 if you wish. With sda1 being vfat and mounted under /cdrom when ubuntu is booted and running, I created a directory and tried to write to it. As /cdrom it is read-only and won’t accept chmod or chgrp commands. I would like these files to be seen under windows when the usb is plugged in. I thought I’d be clever and make another vfat partition, which is fine under linux, but xp recognises only one partition for a usb drive! 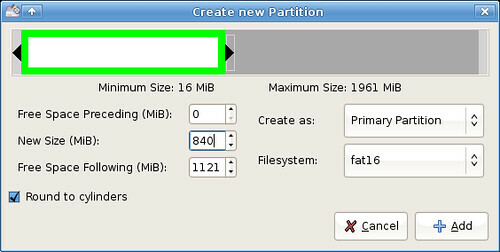 i did this tutorial, but i tried making the first partition fat32 instead of fat16. it doesn’t work; i’ll try with fat16, but is there any reason why it should work with one and not the other? 1) The FAT partition does not need to be, as far as I can tell, FAT16. The “vfat” option can create some problems with syslinux, but I think FAT32 does not change anything. what I think is a different solution to boot Feisty persistent (modifying only the “init” file in the init ramdisk and without pinning anything). I’ve successfully got this to work on a Koolu, and I want to say a big Thanks for everyone who made this possible. I finally have a totally solid state computer running Ubuntu! It has no moving parts: no fans, no disks, no noise whatsoever, and TINY! I have a 4GB flash drive, and I’d rather have Ubuntu take up more space on the flash drive, and not be compressed (as it is on the Ubuntu Live CD). Is there some way to set up Ubuntu on a flash USB drive, and NOT have the performance of Ubuntu be degraded because it is constantly being “gunzipped” in real time? To give you a rough idea of how much overhead the gunzipping seems to be causing, here are some rough timings comparing Ubuntu (as set up above) running on a USB flash drive, vs. Slax Popcorn Edition 5.1.8 running on the same USB flash drive. Thanks usbuser, those commands to take out the bloated KDE stuff I don’t want from Slax 6 will really help! can the casper-rw partition be formatted in something other than ext2? say … FAT16/32? ideally i’d like a USB stick that, if i’m running XP, i can use firefox off and other apps that will run in XP and linux (keep all settings the same across both). OR, i could use the same USB to boot into linux (ubuntu) and use the app (linux version, obviously), but the settings again are pulling from the same partition. does that make sense? for instance, in XP now, i can use the portableapps suite to run firefox, pidgin, etc and save the settings back to the USB. i’d LOVE to be able to run ubuntu off the same USB, if i booted from it, and run firefox, pidgin, etc that i installed on my USBuntu stick that points to the same settings files. any clearer? tj, it ought to be possible but it’s not so efficient. However, I was thinking the same as you but thought of using another USB drive to hold my documents. I first tried labelling it home-rw, but unfortunately it would not be used as /home . So now I’m going to try (some time) to add it to /etc/fstab to be mounted as /home/ubuntu . Or perhaps just as /home/ubuntu/documents so that all my preferences will (along with all afterwards installed programs) still be saved to my casper-rw partition. Sorry Vincent, but if you are looking for a XFCE based distro with loads of good software and easy to make persistent ( just copy a file from the CD to the root of your USB stick). I will then recomend Wolvix 1.1.0 Hunter. I love it and I know what I am talking about because I have put Xubuntu, Knoppix, PClinuxOS and Puppylinux on stick until Wolvix came along. 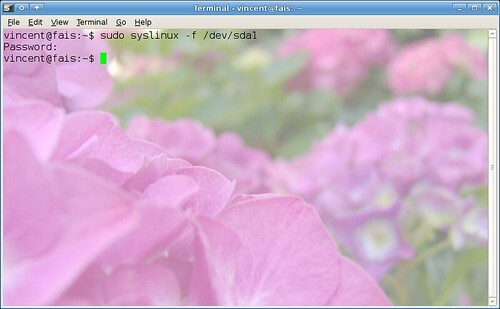 This distro will stay on my USB stick and is running on VMWARE alongside with XP on my server. So, I can have best of both world. I mostly use Wolvix and only need XP as host OS for the VMWARE !! About virtualization software: VMWARE server is free and so is VirtualBox !! Both are available for linux AND MS !! Play with it and as long as you have a decent CPU, some spare HD space and at least 1 GB memory, all OS installed will run smoothly !! I have followed this great tutorial with a 4GB pendrive. I get it to boot me to the menu where you can choose between persistent and live mode. But if I choose either of them I get the message box: Loading Linux Kernel, which goes to 100%, but after that nothing happens. I have checked the md5 of the iso. Also, I have a feisty install on my HDD that works perfectly. I do like beer, in fact I got one yesterday !!. Believe me, nothing is really free. That Dutch idiom is talking about free as in free beer, or gratis (which is also a Dutch word). And Ubuntu and a lot of other Linux distributions prove it wrong, because I have, in all those years I have been using Ubuntu and later Xubuntu, I have not spent a cent on it. However, it is very difficult indeed to have a completely free-as-in-freedom or libre (in Dutch: vrij) operating system, which my newest post (that took a while) is about. It is a shame, though Gobuntu is a good try. OK, I must say thank you! It worked for me – exactly step by step (used Memorex USB UltraTravelDrive 120G hard drive). Do you know if Ubuntu 7.10 Alpha 5 has Persistent working? I downloaded and got it on a 2Gb usb. But still does not work in persistent. Not sure if it’s because I’m doing something wrong or it’s not working yet. I type ; [live Persistent] at boot prompt. I imagined that it was fixed since the Official release is coming soon. 7.10 looks good so far. wilsonb, I did manage to get Xubuntu 7.10 Tribe 5 working on my USB drive (using the Xubuntu instructions (which don’t require you to do some workarounds, you just need a different image and, for Ubuntu, a larger first partition) but if I recall correctly, persistence was not working (and I think the pics folder wasn’t there either). I later tried to put a daily build of Gutsy on my USB drive but I couldn’t even get that one to boot. Then I posted a message on the forum thread asking if anyone got Gutsy working but I’ve received no reply so far. I’m eagerly following your progress on the bug page because I’m also hoping to give Gutsy a try. Fantastic. I have feisty booting from my USB stick — and I’m posting from Ubuntu now! Way cool. However, it seem to take a long long long long (etc.) to boot — much longer that from CD. I figured that booting from stick would be much quicker then CD — but not the case. Any ideas on why it would take forever to load the kernel and the .gz file (what the heck is it called, initrd.gz?)? I don’t want to install yet on my hard drive ’cause I’m not ready to give up Windoz. Thanks all — I have a lot to learn about this opsys. For example here, reading the kernel and initrd.gz: CDROM 2m30s. With 7.10 so close, I’m not going to attempt to install this on my hard drive, but it’s a bit of a head scratcher. I admit, I haven’t studied this blog, but that’s the next step. Reading kernel and initrd.gz from CDROM under 2s, from USB stick more than 2m30s. Wolffy, too bad. A guide for setting up Gutsy on USB is coming, so you might want to give that a try. I’m first working to get a review of Xubuntu Gutsy up (it has so many improvements, it takes ages to finish 😛 ) but it should be coming one day or another (what a nice excuse to get you to subscribe to my blog 😉 ). I had to re-install Windows over the weekend, so I thought it would be a great time to leave some disk space for Ubuntu. I figured that two partition of 2MB each would be more than enough — since my USB stick is 2MB and it worked fine (except for the 10 minute boot). I’m sure you already see the error of my ways. For some stupid reason, I equated 2MB with 2GB and couldn’t figure out why the install kept filling up the partition. And, I’ve already lost 5 hours of my life to the Windows re-install. So, the question at hand: Is there some kind of OpenSource or Shareware (or cheap) product that will re-partition my drive with losing the current Windows partition (I’m not give another 5 hours of my life to Redmond)? I also don’t want the shell out $70 for PartitionMagic for about 30 seconds of use. Another option would be an OpenSource, Shareware (or cheap) product that would copy off the current partition and copy it back after. Grrrr — I’ll never watch football while geeking on my computer again. I was wondering if there were any difference between setting up Ubuntu (Gustsy) on a USB pendrive and a USB external drive ? Any opinion is welcome… I dropped this question on the pendrivelinux site but got no answer. Chris, I haven’t tried an external USB drive, but I believe it should be possible to follow the same process for that (what would the filesystem matter?). However, if it’s a big drive, it might perhaps be worthwhile to do a normal install (if it’s possible) because that will boot faster and won’t be configured to work as a non-persistent LiveCD. For example, I could not install Restricted Drivers on my USB drive, which would work on a normal installation. What I don’t understand is : why shouldn’t one do a normal install with pendrives, flash memory sticks, … in the first place ? Is it because they are not ‘real’ psysical drives (just flash memory) ? Size ? Wouldn’t there be problems of hardware recognition, data saving (persistent aspect) with a normal install ? Chris, size is indeed the main issue. On a LiveCD, the whole system is compressed (just like e.g. you’d compress many files into a .zip or .tar.gz archive to make the total filesize smaller). When you boot from a LiveCD, it will extract the whole system so that it can function normally. We replicate that process here on a USB drive. A normal installation can take up far more than the 840 MB we use here, and thus even if it would fit, it would leave very little space for changes to be saved. Please note, though, that this is as far as I understand it, there may be more downsides. I installed gutsy on my 4gb pendrive last night following instructions found here. Perfekt tutorial work around! Now I wait for the Bugfix and the possibility to save. Thanks for the USB pendrive link Michael, we have just saved a lot of time, much appreciated. I follow Vincent’s how-to step by step. However, my computer does not recognize my 4GB USB as bootable. I then followed the troubleshooting instruction to enter the command “cfdisk /dev/sdb” (‘b’ is where my USB is located). Then I pressed enter to set the FAT16 partition to bootable, however it still does not boot. When I load my hard drive linux and use the cfdisk command again, the FAT16 partition is still not set to bootable. Any I missing something? Do I need to save my changes somehow? Thank you in advance for your help. First of all, you probably want to install the latest Xubuntu 8.04 to your USB drive. I believe there are already tutorials for that online and I’m still planning to write my own. Anyway, I think your problem is that you haven’t configured your computer to boot from USB. When you boot, there is probably something along the lines of “press F for boot menu” where you should be able to select your USB drive. Alternatively, you have to open your computer’s BIOS and configure the boot order to include your USB drive. It might also be possible that your computer can’t boot from USB at all – perhaps you might give it a try at a different computer. Vincent, thanks for getting back to me so soon. I have entered my Setup menu with F2 and changed the boot order to boot from USB first, then a CD, and lastly my hard drive. Since it does not recognize my USB, it is going straight to my hard drive. I will check to see if the USB boots on another computer. Do you think using a Dell laptop should be able to boot from USB. I have been trying it on a Dell Precision 370 desktop (old I know). Thanks again. Hmm, OK, so that’s not the problem. If it’s there in the menu, I suppose your computer is capable of booting from USB too. I’ve made a screenshot of what cfdisk says for my USB drive. Did it show the “Boot” flag for you like it does for me? Yes, my screen is almost exactly the same as yours. Once I enter the cfdisk command, I can type ‘b’ to make the partition bootable and then ‘q’ to quit. But when I execute cfdisk again, the boot flag is not set for the FAT16 partition even though I just went in and did it. I am assuming both USB partition should be unmounted when I change the boot flag. Thank you. That worked…thank you very much. We have tried the whole procedure but it fails at the booting. it always show a message that said unable to find casper/.vml. @Alredo – sorry, wouldn’t know how to help. I recommend you to try following a tutorial on how to use the latest version of Ubuntu. I just published an up-to-date tutorial that addresses the persistent issue. It has all the required steps and it has been tested.